The Last Supper (Italian: Il Cenacolo or L'Ultima Cena) is a 15th century mural painting in Milan created by Leonardo da Vinci for his patron Duke Ludovico Sforza and his duchess Beatrice d'Este. It represents the scene of The Last Supper from the final days of Jesus as narrated in the Gospel of John 13:21, when Jesus announces that one of his Twelve Apostles would betray him. The Last Supper measures 460 × 880 centimeters (15 feet × 29 ft) and covers the back wall of the dining hall at Santa Maria delle Grazie in Milan, Italy. The theme was a traditional one for refectories, but Leonardo's interpretation gave it much greater realism and depth. The lunettes above the main painting, formed by the triple arched ceiling of the refectory, are painted with Sforza coats-of-arms. The opposite wall of the refectory is covered by the Crucifixion fresco by Giovanni Donato da Montorfano, to which Leonardo added figures of the Sforza family in tempera. (These figures have deteriorated in much the same way as has The Last Supper.) 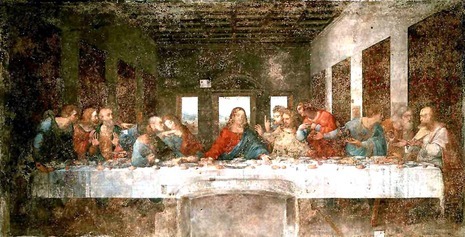 Leonardo began work on The Last Supper in 1495 and completed it in 1498—however, he did not work on the piece continuously throughout this period. This beginning date is not certain, as "the archives of the convent have been destroyed and our meagre documents date from 1497 when the painting was nearly finished." * Bartholomew, James, son of Alphaeus and Andrew form a group of three, all are surprised. * Judas Iscariot, Peter and John form another group of three. Judas is wearing green and blue and is in shadow, looking rather withdrawn and taken aback by the sudden revelation of his plan. He is clutching a small bag, perhaps signifying the silver given to him as payment to betray Jesus, or perhaps a reference to his role within the 12 disciples as treasurer. He is the only person to have his elbow on the table. Peter looks angry and is holding a knife pointed away from Christ, perhaps foreshadowing his violent reaction in Gethsemane during Jesus' arrest. The youngest apostle, John, appears to swoon. * Thomas, James the Greater and Philip are the next group of three. Thomas is clearly upset; James the Greater looks stunned, with his arms in the air. Meanwhile, Philip appears to be requesting some explanation. * Matthew, Jude Thaddeus and Simon the Zealot are the final group of three. Both Jude Thaddeus and Matthew are turned toward Simon, perhaps to find out if he has any answer to their initial questions. These names are all agreed upon by art historians. 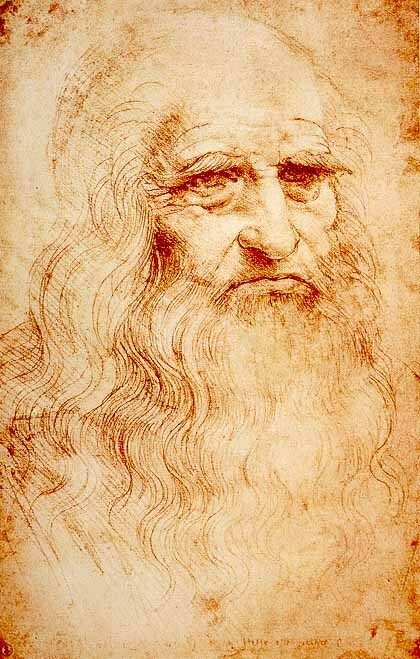 In the 19th century, a manuscript (The Notebooks Leonardo Da Vinci pg. 232) was found with their names; before this only Judas, Peter, John and Jesus were positively identified. In common with other depictions of The Last Supper from this period, Leonardo adopts the convention of seating the diners on one side of the table, so that none of them have their backs to the viewer. However, most previous depictions had typically excluded Judas by placing him alone on the opposite side of the table from the other eleven disciples and Jesus. Another technique commonly used was placing halos around all the disciples except Judas. Leonardo creates a more dramatic and realistic effect by having Judas lean back into shadow. He also creates a realistic and psychologically engaging means to explain why Judas takes the bread at the same time as Jesus, just after Jesus has predicted that this is what his betrayer will do. Jesus is shown saying this to Saints Thomas and James to his left, who react in horror as Jesus points with his left hand to a piece of bread before them. Distracted by the conversation between John and Peter, Judas reaches for a different piece of bread, as, unseen by him, Jesus too stretches out with his right hand towards it. (Matthew 26: 17-46). The angles and lighting draw attention to Jesus, whose head is located at the vanishing point for all perspective lines. The painting contains several references to the number 3, which may be an allusion to the Holy Trinity. The Apostles are seated in groupings of three; there are three windows behind Jesus; and the shape of Jesus' figure resembles a triangle. There may have been other references that have since been lost to the painting's deterioration. Why Is the Composition Remarkable? First, because the disciples are all displaying very human, identifiable emotions. "The Last Supper" had certainly been painted before. Leonardo's version, though, was the first to depict real people acting like real people. Secondly, and of major importance - the technical perspective in Last Supper is incredible! You can see that every single element of the painting directs one's attention straight to the midpoint of the composition, Christ's head. It's arguably the greatest example of one point perspective ever created.